The world’s 10 biggest investors have repeatedly thrown their weight behind attempts to overturn controversial stock structures that let founders like Facebook Inc.’s Mark Zuckerberg retain control. But not even the likes of BlackRock Inc., Vanguard Group and State Street Global Advisors can outweigh his super-powered shares in a vote, an analysis from shareholder voting data provider Proxy Insight found. 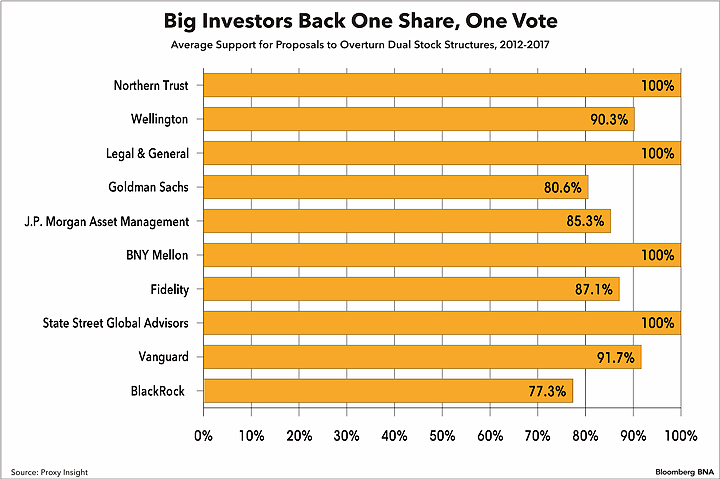 Big investors have endorsed efforts to get rid of super voting shares 91 percent of the time on average since 2012, which Proxy Insight says is “incredibly high” for proposals often put forward by much smaller shareholders. The extra voting power that founders’ shares carry means shareholder proposals seeking one vote per share are doomed to fail. “We nonetheless feel it’s important to weigh in with our perspective on the issue, both through voting and through our engagement with companies,” Glenn Booraem, Vanguard’s investment stewardship officer, told Bloomberg BNA. Vanguard is one of several asset managers and owners that have come out against stock structures that give different rights to different groups of shareholders as more companies experiment with unequal voting power. Voting rights have become such a corporate governance concern, especially for heavily indexed investors, that major index providers recently stepped in. Newly public companies like Snap Inc. that give minority shareholders little to no say will be kept out of benchmarks including the S&P 500, while others like Facebook that offer investors more of a voice will stay in. That’s setting up a clash with stock exchanges looking to woo listings by loosening rules on multiple share classes. “We have a one-size-fits-all mentality to corporate governance,” said David Berger, a Palo Alto, Calif.-based attorney at Wilson Sonsini Goodrich & Rosati who helped Google popularize voteless stock a decade after it went public. He said straying from a one-share, one-vote standard can work well for some companies and not so well for others. At Google parent Alphabet Inc.’s shareholder meeting this year, a bid to overthrow Larry Page and Sergey Brin’s majority voting power would have gotten more than 70 percent support if the two founders’ shares were removed from the equation, Proxy Insight’s analysis showed. The vote in favor of a similar effort at Facebook would have been almost 80 percent without Zuckerberg’s shares. Neither company commented on those findings. “That’s precisely why founders want these structures, so they don’t get ganged up on,” Andrew Winden of Stanford University’s Rock Center for Corporate Governance told Bloomberg BNA. Having multiple classes of shares, including voteless ones, isn’t a new phenomenon. But founders are increasingly turning to such structures to shield themselves from pressure by public investors, according to Winden’s research. What started with a couple of companies per year in the 1990s and early 2000s has turned into many times that number lately.